"Poetry From the Heartland" is a collection of forty-two inspirational poems beautifully illustrated with over fifty color photos taken by the author that capture the grandeur of God's creation. David A. Bigley loves to travel so this book is illustrated with photos of lighthouses, covered bridges, the Grand Canyon, Canyonlands National Park, Arches National Park, Niagara Falls, along with other waterfalls, windmills in the Sand Hills, sunsets and more. The unique thing about the genre of poetry is that a poetry book is a book that you will come back to time and time again. And each time you will find hope, comfort, encouragement, consolation in your times of despair and something new as you reread the poems that speak to you in your current situation. 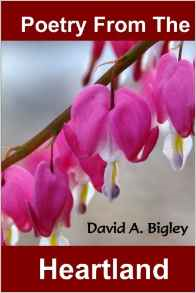 About the author: David A. Bigley grew up on a farm in the heartland of America, while his poetry comes from the inspiration of God's grace and love impacting his internal heartland. He is a minister who has over thirty years of pastoral experience. David is married with four grown children and ten grandchildren. With his wife Lorraine they enjoy traveling and camping in their RV while taking in the beauty and grandeur of God's creation. Along with writing poetry David enjoys being an amateur photographer and this book is beautifully illustrated with photos from his travels. "Poetry From the Heartland" written by Rev. David A. Bigley of First Christian Church in Beatrice, NE. If you would like a copy please go to www.createspace.com/6017956. Books are also available at the Christian Book Store, 511 Court St., in Beatrice, NE.